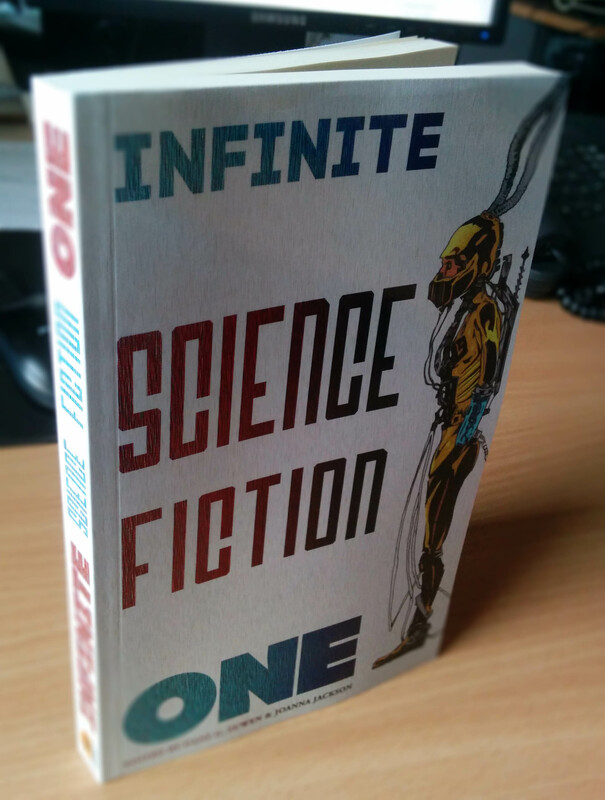 Infinite Acacia’s anthology, ‘Infinite Science Fiction One’ is released today! It’s available from Amazon (USA/UK). Inclusion of my story, ‘By the Numbers’, means that I’m biased, but I think it’s a beauty. This article is filled with spoilers. If you haven’t read it already, you can find the 1952 story itself online here. In the near future, Eckels, a hunter, pays to travel back in time with a safari group to kill a Tyrannosaurus Rex. When they arrive, the hunters are instructed by the guide, Travis, to stay on a metal path in order to avoid having severe repercussions on the future. Upon seeing the dinosaur Eckels becomes terrified and strays off the path, to Travis’s outrage. Back in the present they find that the world has been subtly changed. Eckels discovers a crushed butterfly on his boot, which has caused the changes. Travis raises his rifle. The story follows Eckels in third person. It’s not a close POV. Some direct thoughts are signalled – for example: ‘Eckels remembered the wording in the advertisements to the letter.’ Others are stated directly: ‘The sign on the wall seemed to quaver under a film of sliding warm water’ (an arresting first line that tells us far more about Eckels’s state of mind than it does about the plot). Many aspects of the story are related matter-of-factly. In particular, certain central elements are dismissed with a cursory description (the time machine itself is described abstractly: ‘a mass and tangle, a snaking and humming of wires and steel boxes, at an aurora that flickered now orange, now silver, now blue’. Similarly, details of time travel are abstract: ‘First a day and then a night and then a day and then a night, then it was day-night-day-night. A week, a month, a year, a decade! A.D. 2055. A.D. 2019. 1999! 1957! Gone! The Machine roared.’ The return journey through time is described in the briefest possible manner: ‘1492. 1776. 1812.’ There’s also a wonderfully concise explanation of the paradox of meeting oneself in the past: ‘Time steps aside’. Bradbury reserves by the most detailed descriptions for the Tyrannosaurus Rex , including lots of emotive metaphors: ‘Its mouth gaped, exposing a fence of teeth like daggers’ / ‘Its eyes rolled, ostrich eggs’. Only essential details are given about all characters, including Eckels. Attitudes are neatly conveyed through concise dialogue attributions – for example, ‘”Can these guns get a dinosaur cold?” Eckels felt his mouth saying.’ Peripheral characters aren’t described beyond their function, such as ‘the official’. The introduction of the anti-gravity Path is the first hint of the central tension. At this stage, the readers asks: What would happen if a hunter stepped from the Path? Why would that kind of interaction with their environment be prohibited, when killing a dinosaur is permitted? Travis supplies answers soon after, but the method of ensuring that certain animals are safe to shoot seems dubious. If simply stepping on the grass might endanger a nation, surely killing any animal (even two minutes before its natural death) can only be more severe? The reader is left suspicious and doubtful that the safari can end well. The first time the phrase ‘a sound of thunder’ occurs, it refers both to the arrival of the Tyrannosaurus Rex and the anxiety that Eckels feels. Eckels’s growing fear, and his statement “It can’t be killed,” cranks up the tension. The details of the changed present-day America may be convenient (while the grammar of the English language has changed, and the election has been won by a fascist party, the Time Safari offices are more or less the same), this allows the point to hit home effectively – i.e. that Eckels’s actions have changed the future. We don’t even need to leave the offices to understand all the repercussions. The final line is the repeated phrase: ‘There was a sound of thunder.’ This time it refers to the sound of Travis firing his rifle (presumably, shooting Eckels, through rage rather than any hope of righting the error). It mirrors the first use of the phrase, where it conveyed Eckels’s sense of oncoming doom. What has ‘A Sound of Thunder’ taught me about writing short stories? Save the poetry for aspects that deserve it. Bradbury’s characters and most descriptions serve to push the plot along. But travelling through time and, in particular, the T-Rex warrant the full force of his descriptive skills. Don’t linger. Most of the time-travel ‘rules’ are relayed by Travis. There’s no mucking around with descriptions of the sterilization process or the Path. They’re Macguffins that facilitate Eckels’s journey. End with a punch. While the story’s memorable image is the crushed butterfly (the literal ‘butterfly effect’), this isn’t strong enough to end the story. The reader has expected repercussions from the safari, and the butterfly only explains why the present has been altered. Instead, Bradbury ends the story with the direct threat to Eckels’s life, and the repeated title phrase, which ties the two parts of the story together and makes this a character piece, more than a cold study of a scientific theory. This article is filled with spoilers. If you haven’t read it already, you can find the 1948 story itself online here. An Englishman spends time beside the swimming pool of a Jamaica hotel. He meets a man from South America, then they are joined by an American sailor and an English girl. The mysterious man proposes a bet: if the sailor can successfully light his lighter ten times in a row, he will win the man’s Cadillac; if he fails, the man will chop off the sailor’s little finger. The sailor takes the bet and, in the man’s hotel room, they set it up. After the sailor reaches eight successful strikes of the lighter, a woman enters. She informs the group that the man is an inveterate gambler, that the Cadillac is hers, and that she has won all of the man’s possessions for herself. The narrator sees that her hand is missing three fingers. The narrator is an unnamed Englishman. He’s a barely-involved observer to the main events of the plot. The story is told in first person perspective, close but with direct thoughts attributed using phrases like ‘I told myself’. The tone is precise (‘I went over and sat down under a yellow umbrella where there were four empty seats’) and, at the start, mild (‘It was pleasant to sit and watch the bathers splashing about in the green water’). Some aspects probably wouldn’t be as readily accepted in modern stories. The man’s phonetically-presented dialogue (‘”Excuse pleess, but may I sit here?”’) becomes frustrating, or at least unnecessary. Dahl uses the verb ‘was’ a lot, when perhaps more active verbs might have served the story better – although some may argue that it blunts and simplifies the tone, usefully. Essentially, the structure involves planting the seed of an idea (the bet), then creating tension about: a) whether the boy will take the bet; b) whether he will succeed. The impact of the final reveal is that the sailor nearly lost his finger for nothing, as well as undermining what we think we know about the man from the South. The plot – that is, the bet – is foregrounded over character and setting. We learn little about each character beyond their initial descriptions, and it’s four hundred words into the story before we learn that it’s set in Jamaica. In the 1979 Tales of the Unexpected TV adaptation, the pace slows dramatically for the setup and execution of the bet. Each flick of the lighter is drawn out. It’s interesting that, in the story, Dahl chooses not to do this, as it seems a moment ripe for drawing out tension. The story ends with the reveal that the woman has only a finger and a thumb. I expect that most readers conclude that she won everything from the man through bets that he himself set up, eventually getting lucky. (An alternative reading is that the finger-chopping bet is her own invention, and that the man is a poorer gambler than she is, despite the fact that she has lost many times in order to win overall.) We learn that the man is, in many ways, a hopeless victim, and that the woman (his wife?) is the truly formidable character. What has ‘Man from the South’ taught me about writing short stories? It’s OK to keep character descriptions simple in a plot-centric story. Reusing character description tags may solidify the reader’s mental image of each character. In a plot-centric story, keep the focus fixed totally on the premise. Consider the pacing of key moments. It’s worth questioning whether moments of obvious tension – the execution of the bet – should be drawn out (as in the Tales of the Unexpected adaptation) or relayed at the same pace as the rest of the story. Make sure shock endings are rich, not cheap. The final reveal of the woman’s hand is more than simply a ‘punchline’. It undermines what we thought we knew, and raises questions. However, just before this moment the woman provides answers to many of our initial questions, so it’s a satisfying ending. Shock endings shouldn’t leave the reader stranded. In this story, the woman’s intrusion marks the end of the bet and therefore the plot. Presumably, the narrator, sailor and English girl would have been ushered out of the room moments later, so the reader’s experience of events matches the narrator’s own. In late September my wife and I had a baby boy. Every day with my son is a thrill, but there are minor downsides, including the fact that my novel-reading speed has tanked. That’s not the only reason that I’ve decided to concentrate on reading short fiction this year. I write SF short stories and have had a couple published, but I tend not to read short fiction for pleasure. This seems ridiculous – would you give the time of day to a would-be novelist who didn’t read novels? The more stories I write, the more I realise that I don’t quite understand the conventions of short fiction, or even what I enjoy most. I’m not interested in reviewing short stories critically. Published stories have been endorsed, whereas mine languish in magazine editors’ inboxes, so who am I to criticise? I’m interested in deconstructing stories in order to understand how they tick. This morning saw the new issue refresh of the Garbled Transmissions website. It features my short story, Read/Write Head. Read/Write Head was based on a one-sentence premise that I discovered in an old notebook (“How would it feel to defragment your mind?”) and was then written much faster than my other stories. The word associations were generally those that occurred to me first; the main character has my name as a reflection of the many personal links. The new issue of Voluted Tales contains my short story, By the Numbers. Voluted Tales is an online publication, requiring a subscription, but you can read roughly a quarter of the story for free via this link. My short story, The House Lights Dim, has been published in issue 11 of Sanitarium magazine. It’s a speculative fiction catastrophe story I wrote a couple of years ago, when I was reading lots of Poe and Lovecraft. You can buy a digital copy of the magazine, or a subscription, here.